More risotto! This is a combination of Mio’s Mac and Cheese and Nigella’s Cheddar Cheese Risotto. The danger with mac and cheese is that it can become too dry – especially if you bake it for too long. The danger with risotto is that it can become too gluey – especially if you don’t add enough liquid or let it sit for too long. The good thing about this recipe is that it combines both worlds but minimizes the risk. If you want to make this a faux mac and cheese, top with panko breadcrumbs after toasting in some butter. Heat the chicken broth in a separate pot until warm. Brown the onion and garlic in a few tablespoons of olive oil over medium heat. Add the rice and stir to mix everything over medium heat. Add the wine, red pepper, and mustard and stir until absorbed by the rice. Add the broth by 1/2 cup increments until it is absorbed into the rice. 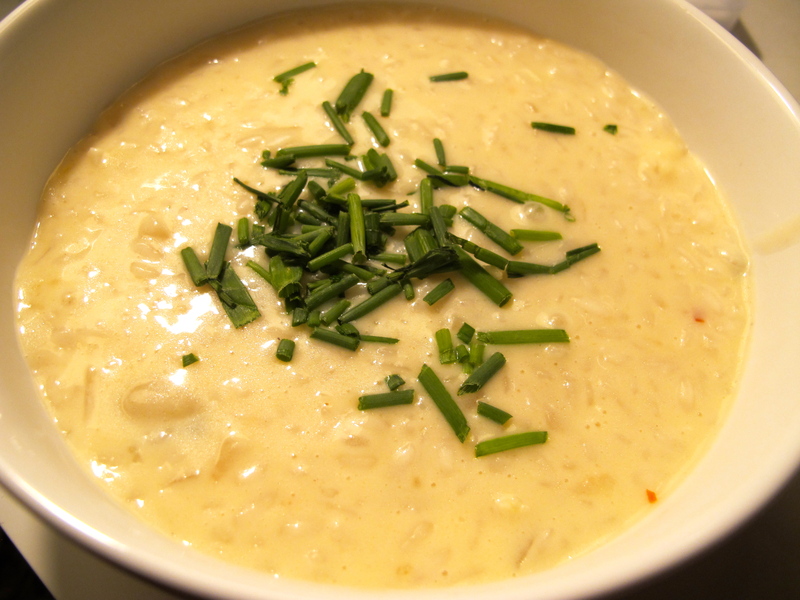 Once you have added 8 cups of broth (or enough that the risotto relaxes on the plate), add the cheddar, parmesan, butter, and sour cream, stir to combine. Salt to taste. Top with chives. Serve immediately. If using the variation, add the chorizo with the cheddar and parmesan.